Walt Disney had a problem. It was September 1953, and the man behind Mickey Mouse, "Snow White and the Seven Dwarfs," "Cinderella" and "Bambi," was moving full speed ahead on his next vision: a family-friendly theme park. His first notion had been to build it on a small plot of land in Burbank, California, next to his animation studio. "But when he started to think about what he wanted to do," says Mike Van Eaton, an animation art expert, "it just got bigger and bigger" -- too big for Burbank, and much too big for his board of directors. So Disney started W.E.D. Enterprises (for Walter Elias Disney), went looking for cheap land in Southern California, and recruited artists and art directors from various studios. They began designing aspects of the park, as Walt's brother, Roy O. Disney, lined up meetings with potential investors: banks and TV networks. But with those pitch meetings just days away, Walt realized he had no big visual for his vision; he needed a show to go with Roy's tell. "They had all these elements, but they didn't have them all together in something they could present to investors," explains Van Eaton. So, on a Friday, Walt called Herb Ryman, a friend and former Disney artist known for working quickly, with an audacious idea: draw a huge, detailed map of the proposed park. Over a weekend Van Eaton describes as "sort of legendary in Disneyland history," neither man slept much, as Walt talked, and Herb drew -- first in pencil on thin vellum, then a final presentation piece in color. By Monday, they'd created the visual Walt wanted, to ship to New York for Roy's meetings. ABC, back then a much smaller network than NBC or CBS, made the Disney deal, in part because it came with two proposed television shows, including "The Mickey Mouse Club," and in part because of that map. It featured such now-familiar elements as Main Street, a railroad, Fantasyland and Frontierland, as well as True Life Adventure Land (they'd eventually drop the "True Life" part), World of Tomorrow (which became Tomorrowland), and the Painted Desert. The map also featured elements that would surprise modern-day park visitors: a circus, which only lasted about six months -- "everybody had been to a circus... that didn't sort of fit into this magical new world that he had built," says Van Eaton -- a church, and a haunted house (not yet a mansion) on Main Street. W.E.D. Enterprises created new, updated maps, as the park was built and eventually opened in 1955. That year, Disney employee Grenade Curran asked Walt about that first map. Van Eaton says Walt had a playful relationship with Curran due to his unique first name, and on Opening Day, Grenade drove special guests around Disneyland in original Autopia vehicles. Curran, now in his 90s, recounts asking Walt if he could have the map, and "Walt turned and said 'You're gonna have it.'" And Curran kept it -- for more than 60 years. Earlier this year, Curran called Van Eaton, whose Van Eaton Galleries in Sherman Oaks, California, had held several Disney memorabilia auctions. Would he look at this old Disneyland map? Van Eaton looked at the photos Curran sent, thinking it was probably a small reproduction -- not the original Disneyland presentation piece. But just in case, he flew from L.A. to Salt Lake City, where Curran lives. "The gentleman met me at the airport with this map," recounts Van Eaton. "We ran over to a table, he unfolded it, I took a look... and I almost fainted. I was there for about 15 minutes, and about three days later I was driving to Salt Lake City to pick this thing up." The map, now verified and framed, is part of the Galleries' "Walt Disney's Disneyland," a June 25 auction of nearly 1,000 artifacts from the various Disney parks. Highlights include an original Fantasyland bench, an Opening Day program signed by Walt, and a Mark VII Autopia car, as well as props, costumes, and souvenirs. But the centerpiece is that map, hidden away for six decades. Since it was unveiled at Van Eaton Galleries last week, collectors, Disney fans, and Hollywood figures have flocked to get a glimpse of this unique piece of Disney history -- the drawing that started it all, that helped Walt and Roy Disney acquire the financing to build their first theme park. 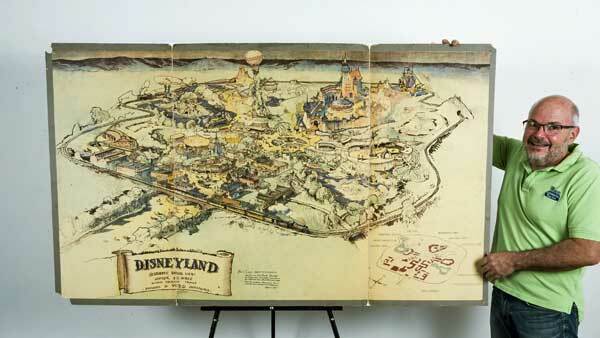 Opening bid for the original Disneyland map: $500,000. Disney is the parent company of ABC-7.